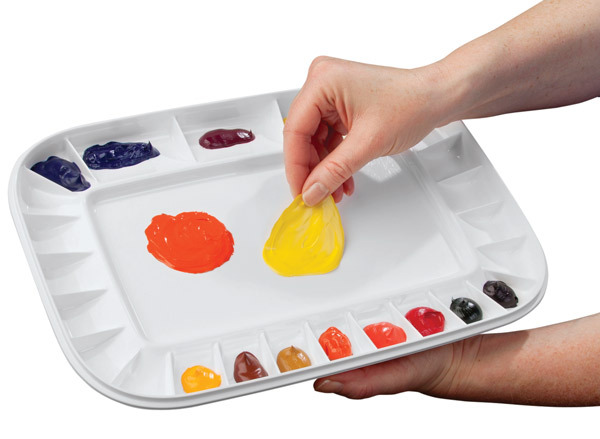 The Mijello Artelier Peel-off Palette features a two-piece, sealable design that can keep oil and acrylic paints fresh for weeks. But if and when your paint does dry on the palette, the high-impact, non-porous plastic construction allows you to simply peel it away. Designed by artists for artists, it features 28 divided wells surrounding a larger central well. The lid provides a tight seal — great for transport — and also functions as a large mixing area. ™ Mijello is a trademark.™ Peel-off is a trademark.